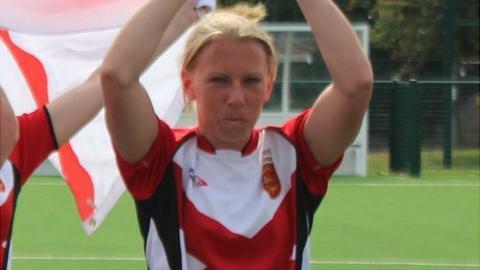 Former Jersey forward Jodie Botterill says she lost the motivation to carry on playing after the team won Island Games gold last summer. Botterill, 30, has since taken on coaching roles at St Peter and the island's Player Development Centre. "I don't think there was much room for progression with my career. "I came into this season not really motivated to play as I have been in the past and the opportunities came my way to coach," she told BBC Radio Jersey. "The gold medal had been a target of mine for a long time. "In local football there's not really much that I haven't achieved and I needed to look at something else to motivate me," added the ex-Wales international. However, Botterill has not yet ruled out a return to playing next season. "I'll make a decision at the end of this season. I'll do pre-season and see how I feel, and if I've got that motivation for next season then I'll put my boots on and get stuck in," she added. "At the minute I know I'm not missing it, but I know what I'm like, and there is a good chance that I am going to play again."